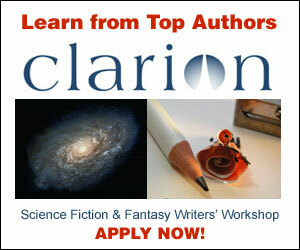 Through March 1st, Clarion is taking applications for its 2009 workshop. If you’re working seriously on the craft of writing science fiction or fantasy stories, seriously consider whether you can shake loose six weeks to attend. I attended Clarion in 2001. I kept a journal of my six weeks at Clarion, so I won’t bother trying to describe all the things I learned or how much fun I had, except to say that it was a lot. If you want to learn more, follow that link, or send me some email–I’d be glad to answer questions.